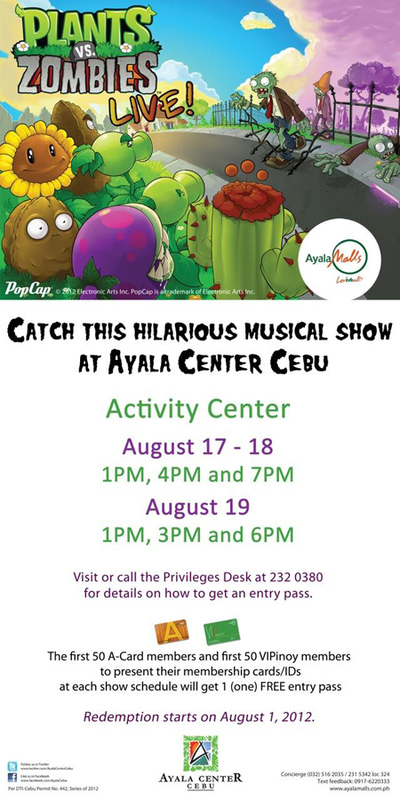 Be among the first to watch Plants Vs. Zombies Live Musical Show at Ayala Center Cebu on August 17, 18 and 19. Inspired by the hilarious game play of the award-winning action strategy PC/Tab/Mobile game. Meet Plants Vs. Zombies Musical Show stars Peashooter, Sunflower, Zombies and a host of other "brave" plants as they defend their lawn against the zombies. Limited seats can be claimed at the Privileges Desk of Ayala Center Cebu through purchase tie-up with any mall outlet. Catch this free musical and more only at Cebu's premiere shopping, dining and entertainment destination, Ayala Center Cebu. The first 50 A-Card members and first 50 VIPinoy members to present their membership cards/IDs at each show schedule will get 1 FREE entry pass. Plants Vs. Zombie Live Hilarious Musical Show is produced by Ayala Malls in partnership with Empire International Merchandising Corporation and PopCap Games, a subsidiary of EA Games. For more information, contact Ayala Center Cebu Concierge at (032) 516-2035 or (032) 231-5342. You can also visit the website: www.ayalamalls.com.ph or like the official Ayala Center Cebu on facebook (www.facebook.com/AyalaCebu) for more details on upcoming shows and events. 0 comments: on "Plants Vs. Zombies Live Musical Show at Ayala Center Cebu come weekend"